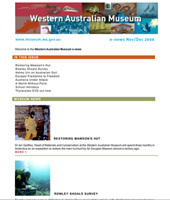 The Western Australian Museum wanted to have an online/email newsletter to expand the Museum's exposure across the community. So a graphic designer from the Exhibition and Design Department and myself designed a simple yet effective e-newsletter. My role was doing the HTML/CSS side of the design, outputting the images into web based formats and making a online registration form for users to signup for the online newsletter.